Many people are already creating content and building their online profiles. To take it one step further, make sure you are putting emphasis on contributing content on third-party platforms versus only on your own native websites and channels. Hear me out. Many people disagree with this approach. They ask: is it not the end goal to drive people back to my website? The answer is yes and no. If you are trying to grow your personal brand as a thought leader in your industry and if you are trying to get more views on your content, then you can drive people to your website. But then you are responsible for a channel that you need to drive traffic to. Another approach is to create content on established platforms and networks such as Medium and LinkedIn. And, you can apply to be a contributor on blogs that are relevant in the industry that you work in. By creating content on these third-party platforms, you are tapping into the benefit of the traffic on that website. If you are a public speaker, for example, then you (hopefully) have a YouTube channel with a number of videos. 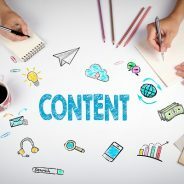 Becoming a contributor on an iconic brand, such as Entrepreneur, and posting your videos on this site, you will be able to reach a far bigger audience than what you would have if you were only sharing your video on your own digital assets. Driving content to your own platforms is great! But, contributing content to established communities can make a big difference to your brand. WSI OMS specialises in content marketing and social media marketing. Contact us if you want to make more money online.